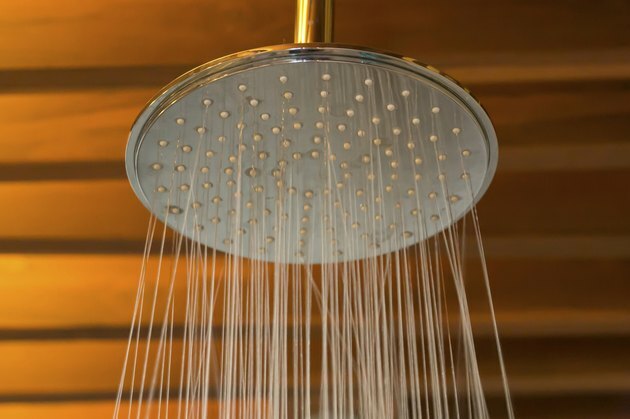 Hot showers have water of temperatures from 96 to 105 degrees Fahrenheit. A hot shower not only feels good, it can also be beneficial to your health. The key is not to stay in there too long, as it can dry out your skin. But five to 10 minutes under hot water can work wonders for your body, muscles, joints and overall mood. Hot water can treat muscular and joint pain associated with arthritis, muscle tears and muscle overuse. The warmth stimulates circulation and blood flow while loosening joints, tendons, tissues and muscles. While it may not cure the pain for good, five minutes under hot water can considerably ease pain, stimulate healing and reduce inflammation. It's more convenient than a massage and more natural than medical treatments. Clogged pores can lead to blemishes and a buildup of toxins in the skin. Hot water and steam open the pores on your skin, making it easier to clean and release impurities. Following with a cold water rinse will close the pores again and make your skin feel refreshed. A hot shower is an effective way to warm up before a morning workout. When you get out of bed in the morning, muscles can be stiff. It's important to be completely warm and loose before any exercise, and a hot shower can get the blood flowing, warm the muscles and prime them for exercise. The steam from a hot shower can loosen phlegm and get rid of mucus that could be causing a cough or sore throat. Adding eucalyptus oil to your skin or the air will make the steam more effective and can help you breathe more easily. A hot shower can also relieve other body aches associated with a cold. A hot shower is a natural sedative. If you are stressed or have trouble sleeping, taking a hot shower for 10 minutes calms your body, mind and nerves. Adding lavender oil will help, because this is a natural relaxation herb.